On May 22, 2011, an EF-5 tornado ripped through Joplin, killing 161 people. Some of those killed were Joplin high school seniors, who had tossed their graduation caps about an hour before the storm hit. The May 22, 2011 Joplin Tornado killed 161 people and injured 1,000 and caused $3-billion in property damage, destroying about 7,500 homes and more than 500 businesses. 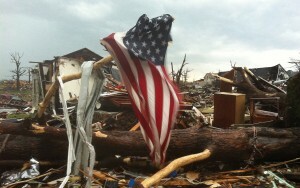 The one-mile wide tornado hit central Joplin at 5:41 p.m. where 531 businesses were shattered. About 7,500 houses, apartments and duplexes were also in the path of the storm. The destruction displaced nearly 20,000 people. 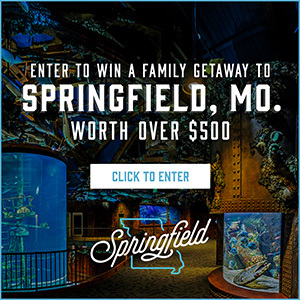 Joplin is a city of about 50,000 people. During a workday, that number swells to about 250,000 people. Joplin is a regional business hub according to Kirstie Smith with the Joplin Chamber of Commerce. She says losing that many businesses could have crippled the community. 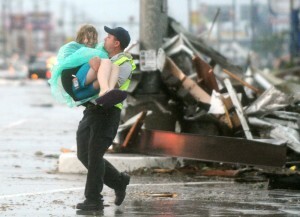 An emergency worker carries a girl out of Academy Sports on Sunday evening, May 22, 2011. Photo courtesty Joplin Globe / Roger Nomer — www.joplinglobe.com to see more. Smith says the aftermath of the storm was described by some as looking like a war zone. People rolled up their sleeves and by the end of the summer, all debris had been removed. The rebuilding effort began. Five years later most of those businesses that were destroyed have been rebuilt. The Chamber of Commerce set a goal of rebuilding 500 businesses and creating 500 new ones. Several events are planned for this weekend in Joplin to mark the five year anniversary of the storm, and the rebuilding effort that followed.